The width of the blade 26-30. The hardness of the blade 62. The thickness of the handle 21,5-24,5. The total length of 265-275. Includes: knife, leather cover, certificate. US and Canada typically 15-35 days. Today Vorsma known as the Russian blade center of Russia, and so we contribute to its development and prosperity. Our smithy manufactures hunting, gift, travel, household knives. Knife Production time is approximately 1 month from the date of order. Our main specialization is the manufacture of cast steel knifes Bulat and Damascus steel. 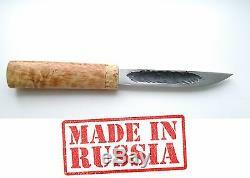 Steel Bulat and Damascus steel is the best material for the manufacture of klinkov. Stal Bulat characterized by high hardness and strength, high cutting properties. Damascus steel is characterized visible irregularities on the steel surface, often in the form of patterns, which gives a certain individuality to each blade. The main disadvantage of Damascus steel and Bulat is the price. As the "economy version" we can offer the manufacture of knives made of stainless steel 95X18, 110H18. Blades of steel 95X18, 110H18 have a high hardness, good flexibility and sufficient strength, the knife of this material is not as easy to sharpen well as the usual kitchen, but keep the sharpness of the blade will be well. We can also offer knives imported steel from the D2, which is sometimes called a "semi stainless" has high strength and corrosion resistance. All cutlery certified in Forensic Science Center of the Interior Ministry and knives are considered household purposes; are not machetes. Date is calculated by check or, in his absence, by the level of finished goods warehouse. We pay great attention to the quality of production of our knives. Each knife imbedded part of the soul of our masters, and his every knife unique. The item "Russian Knife Yakut Karelian birch handle Damascus Military army Tactical USSR" is in sale since Saturday, January 14, 2017. This item is in the category "Collectibles\Knives, Swords & Blades\Collectible Fixed Blade Knives\Modern Fixed Blade\Custom & Handmade".world" and is located in -, default. This item can be shipped worldwide.